Engineer as well as perform inspections of vessels for repair and maintenance standards and procedures working with other company engineers as needed. Job Conditions and Environment: This job requires the ability to travel be- tween our ports as well as receive emergency repair calls after hours. Weekend work is re- quired. The work may occur under adverse weather conditions. Travel may be involved on certain projects. It also requires the ability to ? t into tight ? tting spaces for repair work. Inc. knows this and is renowned for high quality work and a strict adherence to proj- ect costs and schedules. A seasoned staff and 24/7 Operations have enabled us to become the premium shipyard on the Gulf of Mexico. Assurance Manager to join our 40+ year Op- • Ability to interact with others using cour- eration in Tampa, Florida. 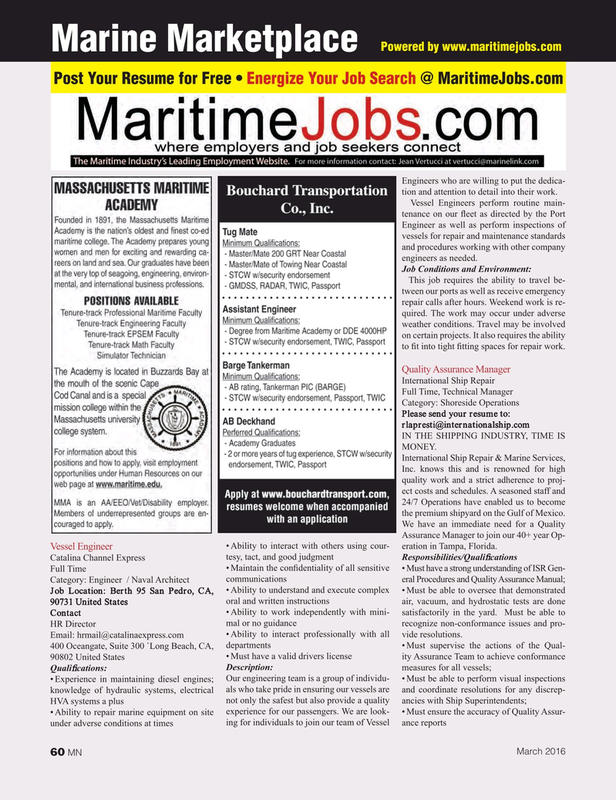 Email: hrmail@catalinaexpress.com • Ability to interact professionally with all vide resolutions.